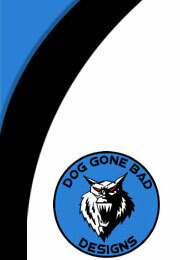 At Dog Gone Bad Designs we know and understand all aspects of the technologies that control the Internet. Our many years of experience will insure your design loads fast and displays properly on all major computer platforms and browsers. We also know how to get your site listed with the major search engines and increase your ranking on the search engine's hierarchy. Why settle for an ordinary or generic web site when your's can be Dog Gone Bad?